September 24, 2013 - There are two principal types of aviation engine fuels used in aviation, aviation gasoline (Avgas) 100LL used in general aviation to run piston engines and Jet A-1 which is used in commercial flights which run turbine engines. If you are a general aviation pilot then you are familiar with Avgas and the cost of fueling your aircraft. Nationwide 100LL Avgas cost about $6.03 per gallon, as a result of this high price there are fewer pilots flying today, numerous flight schools and FBO have closed their operations, aircraft are left at the airport rusting away and airport operators are doing their best to keep their doors open. Redbird Skyport which is an aviation laboratory and Fix Base Operator (FBO) located at San Marcos Municipal Airport (KHYI), San Marcos, Texas has partnered with Garmin, Aspen Avionics, King Schools, ForeFlight, Bendix King, EAA, GAMA, Jeppessen, Phillips 66, Piper Aircraft, Avemco Insurance, Sennheiser, Hartzell, Bad Elf, Brown Aviation Leasing, the City of San Marcos and some local businesses to offer Avgas for $1 a gallon for the month of October 2013. The purpose of offering avgas for one dollar a gallon is to encourage pilots to take advantage of the finical savings and to conduct a study which will aid researches in develop real-time data on how fuel price really influence aviation activity. Jeff Van West, Director of Redbird Skyport Media said “This experiment isn’t about the cost of avgas it’s true that we’re selling avgas for $1 per gallon for the entire month of October. But we’re really using fuel price as a catalyst to stimulate activity and generate data. “We chose October for this test to take advantage of the fantastic flying weather in Texas, and give pilots additional incentive to fly to AOPA Summit in Fort Worth, October 10-12, and the Migration Flight Training Conference at Skyport, October 28-30,” says Van West. “When the month is up, we expect to have fresh insight into how fuel price really factors into the many forces affecting how often GA pilots fly.” During October while the one-dollar fuel is available, CEOs and other leaders from partner companies will conduct town meetings at the Skyport to answer pilot questions and hear opinions on the direction of their products and the aviation industry. Pilot opinions on what motivates them to fly will also be part of the data published when the experiment is complete. - Why are you doing is? The purpose of this experiment is to study the effect that fuel price has on flying activity as well as understand how fuel price factors into the complete cost picture. - Can anyone get $1 Avgas? The offer is open to any piston-powered GA aircraft that can fly into San Marcos Municipal Airport under its own power. Only the regular tanks in the aircraft will be filled. - Are you going to run out of gas? No! To maintain a reliable supply for everyone and keep delays to a minimum, the fueling limit is 200 gallons per aircraft per day. Aircraft requiring more than 200 gallons may purchase that additional amount at the regular price. We won’t fuel aircraft that we believe are violating the spirit of the experiment. Will it really last all month? Yes, the $1 price is valid for the entire month of October during normal operating hours, 6am to 10pm. - How long will the lines be? We hope not, but there may be lines to get gas. If you expect to be in a hurry, we recommend you pre-register on the website or by calling us at (512) 878-6670. For those who aren’t in a hurry, we hope you will stop and stay awhile. There will be plenty to do at the airport and around town. On Saturdays during the month we will have town halls with leaders in the aviation industry. 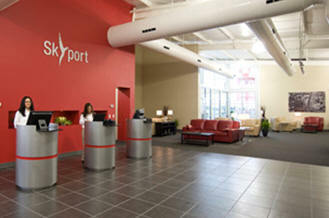 We will also have cookouts on the weekends in addition to the regular menu at the Skyport Galley. Plus, TVs throughout so no one misses a football game. - Is ATC going to be a nightmare? We hope not. We have coordinated with San Marcos tower and Austin approach to make sure things go as smoothly as possible. - Do you have enough ramp space? Yes. San Marcos Airport is a former military training airport and has acres of ramp space, so space for waiting or parking overnight is not a problem. - Can my group have a fly-in? Of course! We would love to have you. We ask that you register as a group so we know to expect you. Also, please let us know if there is anything we can do to help out. - What are you going to do with the survey data? Data collected from pilots during the month will be aggregated before publication. Absolutely no individual personal information will be shared.